Gothenburg – the cities of cities. The ocean, salty breeze, seagulls, the pulse and the archipelago. What is there not to like? Even if this is your home town or a place you just like – it's worth having it as a wall hanging at home as a reminder of all the good stuff that goes on in Gothenburg. Go sit down by the dock, feel the salty winds on your skin, bring out your embroidery and do some cross stitching. Perfect as a gift or for you who love cratfs and are in love with Gothenburg! This exclusive embroidery allows you to embroider your own favorite city in the form of a beautiful skyline in cross stitch! 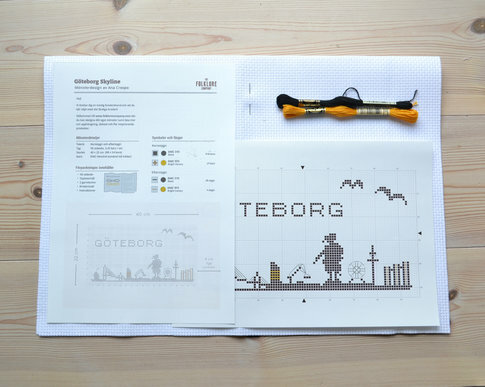 Perfect as a gift or a DIY-kit for those who love Gothenburg! Embroidery kit Aida "Cool on Instagram"